Getting great reviews of your flower shop is key to getting florist website orders. What can you do to get better reviews of your shop – here are a few ideas to build your florist website business. Customers and search engines look at your reviews and scores on review websites. 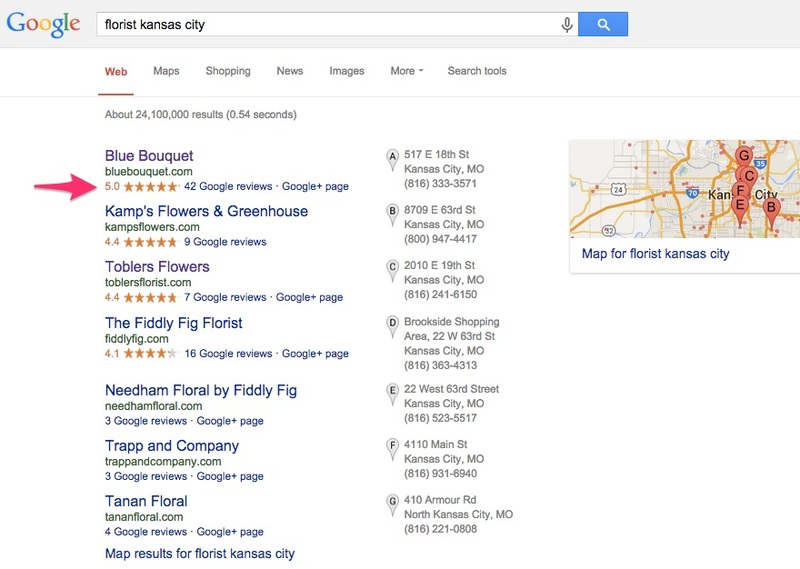 But it’s not just the review, the number of reviews matters too – Google views websites with as more important. More reviews means a more trusted brand. And if you have more reviews, one negative review will not have the same impact. Encourage Customer Reviews in Store – During and after every sale, ask your customers to leave you a review on Yelp or Google. Be prepared with flyers, business cards and any other creative means you can to let your customers know you want their opinion and where they can find you online. A florist shop that gets lots of reviews overall looks better to customers. Many positive reviews take the sting out of a bad review whenever it happens. Email Friends, Family – Email trusted parties like friends, relatives, and loyal customers with a link to the page to add a review. Make sure to include the link or links so your friends can easily add their own review. Send out these emails over time rather than in one go so it spaces out the positive reviews over time. Email Happy Customers After Orders – You can add a link to Yelp or Google Places on your confirmation email after a successful order. Email brides who you know are happy customers a few days after weddings. Contact the customer privately – and politely and ask what flowers you can send them to fix the problem. You can either contact them through the website or use your shop’s florist software to pull that customer’s information up and give them a quick phone call. Listen closely to them to make sure you know what needs to be done and offer them an incentive beyond what they suggest. The customer will probably add a new glowing positive comment that gives visitors a much better impression. Reviews cannot be deleted so the next best solution is to have a second raving review from that customer. Add a public owner’s comment – to a bad review to show everyone who looks at the reviews you care about your customers and want to improve your service. It would be very wise to make time to respond to your customer reviews. You want to have as many positive comments as possible. The best way to deal with a negative review is to make sure it never happens in the first place. Provide the best customer experience possible every day. Listen carefully to what the customer wants and do the best you can to give it to them. Use your flower shop software and the tools it provides to give your customers the best service possible. Satisfaction Guarantee – Advertise 100% satisfaction on your florist website so customers know they can come to you with problems. Make Your Customers Happy – Figure out a way to make an unhappy customer happy. It could be a replacement, a gift card, or a full explanation. A great attitude and undertanding can go a long way to turn a negative experience into an overwhelmingly positive one!